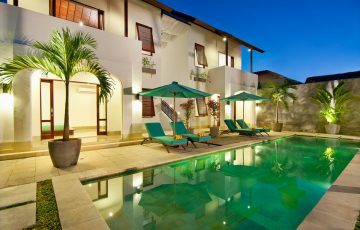 Bali Villas Escapes offers an extensive range of Legian Villas to rent including 1, 2, 3, 4 & 5 bedroom villas. 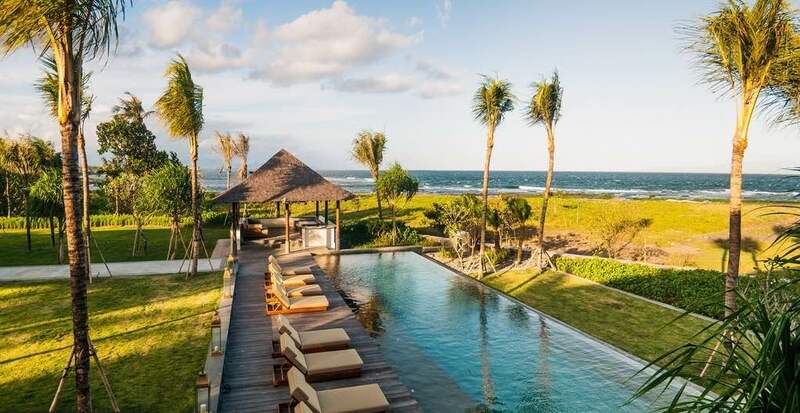 So, if you’re looking for the Best Villas In Bali or have never stayed in a Villa then you’re going to absolutely love the whole holiday experience. 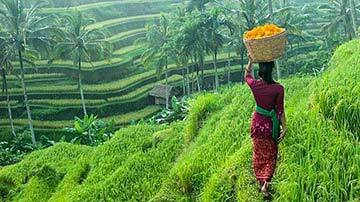 Legian is about a 25 minute taxi ride from the airport & is known for its family friendly atmosphere. All our Legian villa rentals are located very close to the Double Six Beach area where you will find restaurants, cafes, fast food (which is great for the kids), loads of beach bars which become packed at sunset time as well as shops located along Jalan Legian &the famous Eat Street. 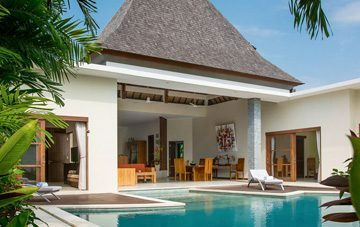 Not only that, our Legian Villas have some other holiday perks on offer including private pools, friendly villa staff and some villas even have breakfast included in the nightly rate. 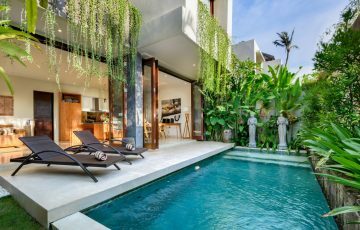 Booking Luxury Accommodation in Bali & Legian will mean your going to be able to relax in total privacy & comfort in your own private Legian holiday villa. 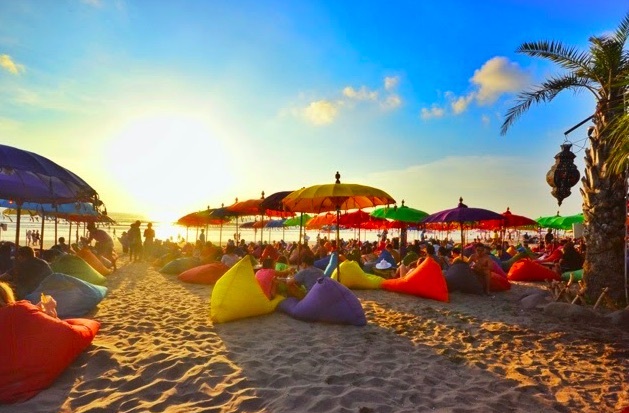 Many holiday makers who are happen to be staying in our Seminyak Villas or our Canggu Villas often come over to Legian just for the atmosphere at sunset time, where they can grab a bean bag at one of many beachfront bars and soak up one of the best sunsets in Bali. The vibe here is incredible with people taking photos, having a sunset drink, having their last swim of the day and then going for dinner by the beach. 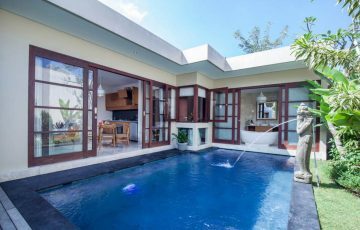 Spoil your family with a holiday in one of our Villas in Legian, you definitely won’t be disapointed. The villa experience is truly sensational. 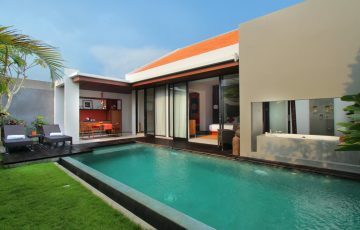 We have the very best villa deals & rates for all Beachfront Villas In Legian. Plus, we make the villa booking process unbelievably simple, with our reservation team ready to take your inquiry. 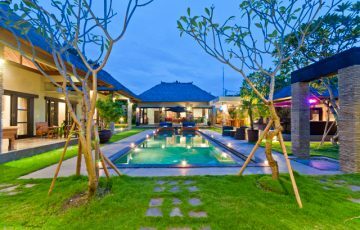 So contact the Legian experts today at Bali Villa Escapes. Rent Villa Michelina in Legian Now - 3 Bedrooms. 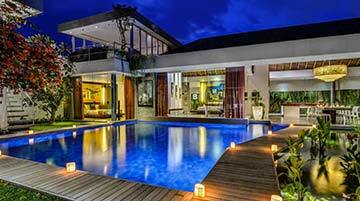 Family or group holiday villa rental accommodation in Legian Bali. Contact us today! Sleeps 6, breakfast included, fully staffed with FREE airport pick up. Do not miss this sensational, value packed gem near Double Six Beach. Rent Villa Suliac in Legian Now - 3 Bedrooms. 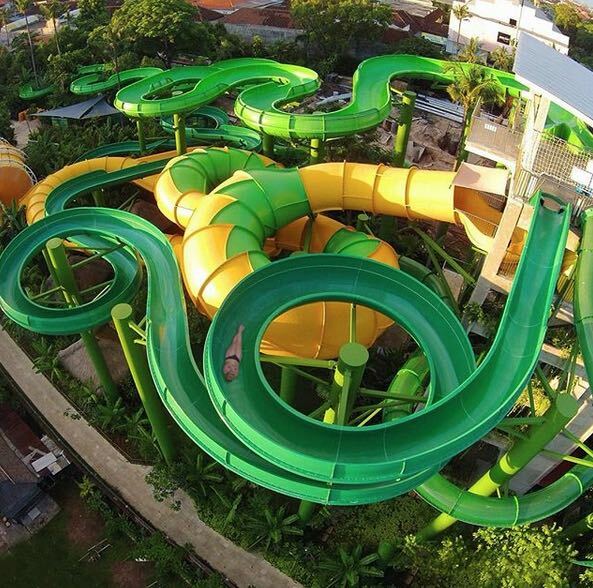 Family or group holiday villa rental in Bali. Contact us today! Sleeps 6 with FREE airport pick up. Central Legian location makes this the perfect place to unwind, relax and enjoy your Bali getaway. Rent Villa Sophia in Legian Now - 4 bedrooms. Family or group holiday villa rental in Bali. Contact us today! Sleeps 8 with FREE airport pick up. Great value for money in a Prime Legian location near Double Six Beach & Bintang supermarket. Rent Villa Mahkota in Legian Now - 4 Bedrooms. 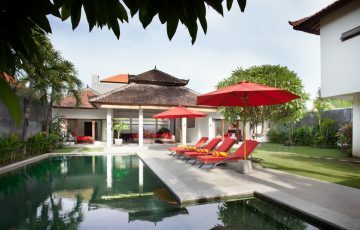 Private pool holiday villa rental in Legian Bali. Contact us today! Sleeps 8, fully staffed, security, breakfast included & FREE airport pick up. Perfect group or family villa for those wanting to stay in a popular location. You will love it here, take a look. 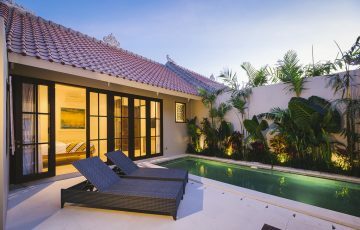 Rent Villa Beautiful Bali in Legian Now - 3 Bedrooms. Family or group holiday villa rental in Bali. Contact us today! Sleeps 6 with FREE airport pick up. Moments to the beach & all those shops & restaurants near the Double Six area. Rent Villa Beautiful Bali in Legian Now - 1 Bedroom. Couples or honeymoon holiday villa rental in Bali. Contact us today! Sleeps 2, breakfast included with FREE airport pick up - near beach, shops, restaurants & nightlife. Rent Villa Beautiful Bali in Legian Now - 2 Bedrooms. Family or group holiday villa rental in Bali. Contact us today! Sleeps 4 with FREE airport pick up. Location & price make this the best holiday villa. 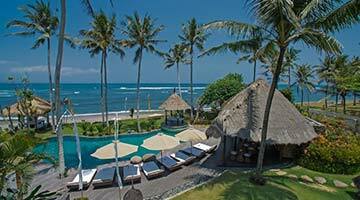 See for yourself - you will not find a Legian Villa in a better area. Rent Villa Abia in Legian Now - 2 Bedrooms. Family or group holiday villa rental in Bali. Contact us today! Sleeps 4, breakfast included, FREE airport pick up & villa staff. Modern villa in a popular location. 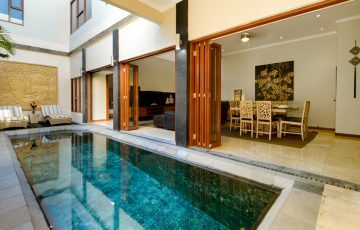 Book this wonderful Legian private pool villa. Rent Villa Alma in Legian Now - 3 Bedrooms. Family or group holiday villa rental in Bali. Contact us today! Sleeps 6 with FREE airport pick up. Top value in popular Legian area. 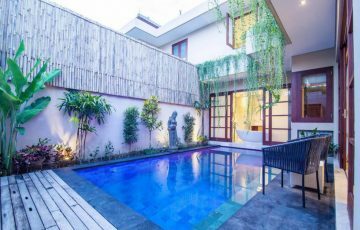 Rent Villa Amalia in Legian Now - 4 Bedrooms. Family or group holiday villa rental in Legian. Contact us today! Sleeps 8 with FREE airport pick up & villa staff. Close to popular Double Six Beach & shops. 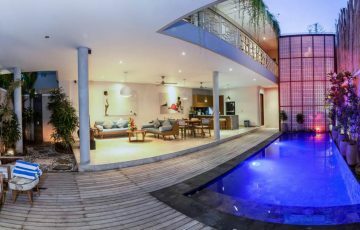 Rent Villa Amira in Legian Now - 5 Bedrooms. Family or group holiday villa rental in Bali. Contact us today! Top Legian location. Sleeps 10 with FREE airport pick up. You will love it here. Rent Villa Toru in Legian - 2 Bedrooms. Family or group holiday villa rental in Bali. Contact us now! Sleeps 4 with FREE airport pick up. Only 5 min walk to Double Six beach. Amazing villa in great location. Do not miss this!